If you live in the Jacksonville area (Duval, Clay, St. John's and Nassau counties) you must pick up your packet at the Runner's Expo on Thursday or Friday. To receive your name on your bib number, you must register before February 10th. All seeded times were checked and verified for the Top 5,000 runners. Once numbers are assigned, there are no changes to starting waves. 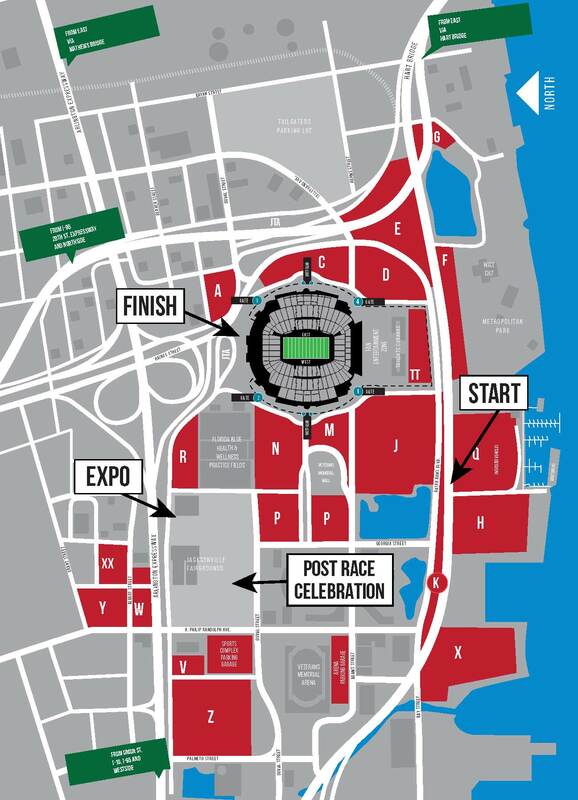 The GATE River Run starts on Gator Bowl Blvd, and finishes on Duval Street in front of the Jacksonville Faigrounds. The Expo is held at the Jacksonville Fairgrounds. All are located in the area of the Fairgrounds located at 510 Fairgrounds Place. For directions from your location, click here. The St. Johns River Taxi will be running early on March 9th as an alternative to participants and spectators who prefer not to drive to the Race site. They will start service at 6:30am. Daily tickets for the River Taxi are $10 for adults and $8 for kids 3 -12. The ticket allows passengers to ride the taxi all day. They will run continuously to and from the Metropolitan Park dock, which is .15 miles from the start of the race and .65 miles from the finishline from 6:30am to 11pm. They accept cash only for special events. Parking for the Lexington Hotel stop is available in the Duval County School Board lot for free, and is a very close walk to get on. The loop is Lexington Hotel dock --> Metropolitan Park dock --> Jacksonville Landing dock --> Friendship Fountain dock --> Doubletree Dock. The loop takes up to 30 minutes if stopping at all stops, but is much shorter depending on where passengers are getting off. The Lexington Hotel to Metropolitan Park loop only takes 5-10 minutes. Come camp at the River Run! Register and pay at the site on Friday, March 8th! The parking lot will be right near the starting line in Parking Lot M (See parking map or Starting Line Layout). Spots will be on a first come, first serve basis. All campers will be required to pay the designated fee to stay in a motor home, fifth wheel, camper or tent. Camp fee will be paid at the time of set up. Each camper will sign a camper agreement with regard to site clean up during and after the event and will receive a pass to display in their vehicle window showing proof of registration. Spaces will be marked and numbered. Generators will be used throughout the night. Campers are required to maintain and cleanup their campsite before departure on Saturday. All campers must pull out by 3:00 pm on Saturday. Registration and setup will be on Friday, March 8th from 12:30 PM - 6:00 PM. No campers will be allowed in after 6:00 PM. Guarantee your perfect spot by calling or texting Michelle at (386) 208-2447! Volunteers are needed to staff the three-day Runner's Expo which will be held on March 8th, 9th and 10th at the Jacksonville Fairgrounds. Each volunteer will receive a free t-shirt. 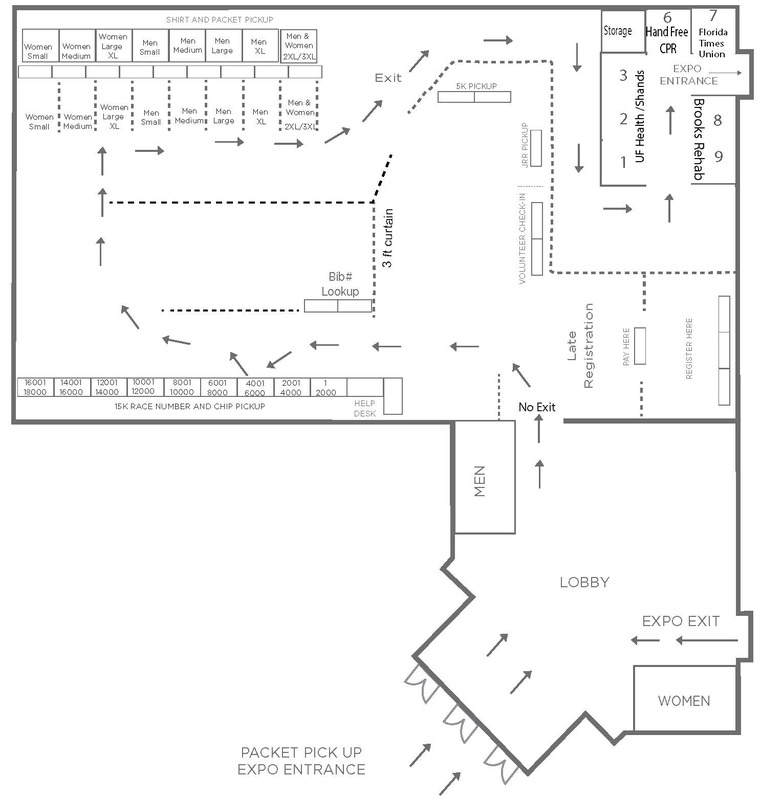 We need about 200 volunteers to adequately staff the packet pickup area. We would like volunteers to work at least two hour shifts, four hour shifts are the best. Wednesday, March 6th from 11 AM until 6 PM. Duties: Unload t-shirts and packets, hang banners and signs, and set up/organize area. Duties: Hand out t-shirts and race packets. Duties: Hand out t-shirts and race packets, and help load up from noon until 2 PM. Have you always wanted to run the GATE River Run, but didn't feel that you knew how to get started or didn't have a training partner? We have the answer! JTC Running is proud to host the GATE River Run training program! Visit www.jtcrunning.com for more information. Click here for an at home training schedule!